Photoelectric sensors may seem rudimentary to a lot of people out there especially if you’re a seasoned vet. If you’re a new guy it may seem a little daunting since there’s so many different options, so many different shapes, sizes, options available, and boy if you pick the wrong one you’ll know it quick. It can definitely be the difference between being a stable logic program that depends on that sensor to make decisions, and also just the stability of the throughput on the line. So you really want to make sure you pick the right photo electric sensor, and it’s not rocket science as there’s really 3 basic types of photoelectric sensors. The first type is a through beam sensor, which is basically an emitter and a receiver that just look right at each other. So, if you break the beam there’s an output, or there may be an output whenever the beams see each other. That’s one way to look at it. There’s also what’s called retroflective and that’ll be where you use a reflector and a sensor. The sensor basically sees its light source bounce off the reflector and come back to the receiver that’s in the same housing. The third type is diffuse reflective which requires no sensor so the light will bounce off the object and come back into the receiver itself. The differences between the three typically are gonna affect your sensing distance and also it can really hinge on the reflectivity of the object that you are trying to sense. So really you just need to take a look at your application, the mounting location of the sensor, how far away you can be or how close you can be to the object your trying to sense. Those factors can really help determine which one of those 3 are going to be the best for you. There are different light sources inside of the sensor and that can affect the sensing distance. It can also affect the stability of the signal, and also in certain environments where there can also be contaminants in the air or light pollution, external light pollution that affects the receiver, you might need a different light source to mitigate some of those. Your typical light sources that you’re going to find in today’s market are gonna be LED lights, infrared lights, laser lights, and every now and then you’ll run into an application that calls for an ultraviolet light inside of a sensor. And again that’s just gonna affect the sensing distance, the stability, things of that nature. Really the number one thing I can recommend when trying to find a sensor and make sure that it’s right is to get a sample and test it, and retest it, and test it with different types of sensors and different types of environments. Always remember to test for the extreme. Don’t test under normal operating conditions because if one day it’s cloudy out or one day the sun is right in your eyes, if you didn’t test for that, if you were just testing for the normal operating environments you’re gonna get an unstable signal. So always test for the worst case scenario, the extremes are what you really want to look for. Another good rule of thumb if you can, is to try to use models with quick disconnects on the back. That’s a major plus for your maintenance staff whenever you need the ability to change a sensor quickly without having to replace the entire wire all the way back to the cabinet it’s wired into – that’s why they designed these. And most sensor manufacturers are going to give you the option to either have a flying lead coming out of the sensor or on the back end of it you’ll have a little M12 or M8 through your 4 pin quick disconnect that this can just hook right into. And so like I said it’s not rocket science, just make sure that you test. I can’t stress enough how many times people think that they know that a sensor will work in an application, they never tested it, and then we get a call saying they need to return the model for a different one because for some reason it didn’t work for one reason or another that would have been easy to test. Omron even manufactures a checker, which is basically a DC power supply that you can wire a sensor into with a little light output that tells you when the output of a sensor turns on. You can even turn on a little buzzer so it’s really handy to be able to hook up a sensor, go out on your line and just start testing stuff and see when you get your output and make sure its stable. If you have any questions, you need help with this, there’s always new sensors coming out, all kinds of new technology that makes them more powerful, gives them extended range, and that’s something Innovative-IDM can really help you with because it’s our job to know that kind of stuff and to be able to help you with any applications that come up. We also have a sensor specialist we can bring in if necessary, you can also find a lot of this information on our website which is innovativeidm.com. Go to our Knowledge Center, where you can find white papers for our different types of sensor applications and best practices. After all we are Home of the Legendary Customer Experience. Hi, I’m Adam Ring with Innovative-IDM. You know, I was just teaching a class last week and a topic came up about different types of sensors that are used for industrial automation. So I thought, well, I’ll take a few minutes and go over some of the basics of how these types of sensors work. The first thing I would like to talk about is the inductive proximity sensor, these are very widely used in automation, they’re used to sense various metal objects. So, basically any kind of metal objects that we need to know that’s present or absence or is there a part in place, is that part missing? Is an actuator retracted or extended? Anyway in which we need to sense something that is a ferrous metal we can use this. Basically what it does, it has this tractor beam that emits from the tip of the sensor, and it’s really what we call an eddy current killed oscillator. What that means is that, there’s this electrical field generated outside the tip of this sensor, and when a ferrous object comes near-by, it actually absorbs that field and the sensor is then able to detect that there is something there and it gives us a signal. Then we have another really common type of sensor that is used in automation; that’s called the photoelectric sensor. As its name implies, it basically uses light in order to detect objects. Something like this has an emitter and receiver, so it emits a light beam and it bounces off of an object and comes back to the receiver and if it sees the light, then it knows that there’s an object there. If it doesn’t get an object back, then it knows that there’s nothing there. So it’s able to easily detect when there’s an object present or absent. Real common use for these is on conveyors, if you want to detect if there’s a box moving on a conveyor, and as soon as it passes by, the photo eye reflects the light and says that object’s there. Very common use in the industry. If you’d like to learn more about these types of sensors and others, please take a look at the Innovative-IDM knowledge base, our website is innovativeidm.com, and we’d love to share some information with you. Remember, we’re Home of the Legendary Customer Experience. Hi my name is Jack Marsh with Innovative IDM. Today I’d like to talk a little bit about Allen Bradley and maybe perhaps why it’s not always the best solution for your application. Allen Bradley makes fine products, and they are quality products, and they’ve got a very broad offering, but they are not always the perfect solution for every application. We’ve really identified, 5 reasons why that’s the case. Then all of their software sold on an alacart basis, so say for example you purchase the PLC programming software then say later on down the road you find that you need to configure some network communications, or perhaps you want to simulate the PLC and HMI interactions without having the hardware present. Well that network communication suit is an additional product you’re going to have to purchase, the simulation package is an additional product you’re going to have to purchase. Wherein a lot of other manufactures those functions are built into the software you buy for the programming. Another thing Alan Bradley does that allows them to offer a very broad product line without incurring high development cost is to private label products from other manufactures, but the downside of that is there is not a consistent look and feel across the product line. So a small ac drive for example may program and configure completely differently than the large variable frequency drives from Allan Bradley. And if one of the manufacturers there private labeling from happens to have a discontinuation or product change there are ramifications for Allen Bradley products that are beyond their control, there might not be a simple replacement for that. And then the last thing to consider is the international support. While Allen Bradley has a very large market share in the US their presence in Europe and Asia is not nearly as large so if you’re building machines for the overseas market and you’re going to need support after it’s installed that might be an issue. If you’d line to research some of the options to Allen Bradley such as Omron, Yaskawa, Parker, or Wago, please visit our website at innovativeidm.com and remember Innovative IDM is the home of the legendary customer experience. Do the machines your company builds have potential hazards associated with their transportation, installation, use, maintenance, decommissioning or disposal? 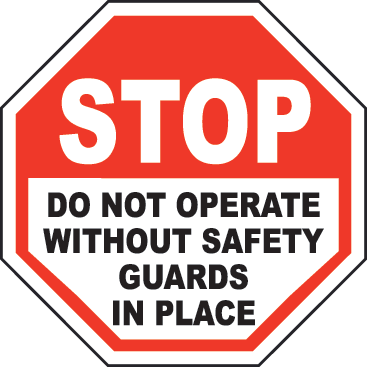 As simple as it may sound, properly designed safety labels can go a long way toward protecting machine operators – as well as your company’s bottom line. Read The Importance of Machinery Safety Labels (September 2014, Control Design) to learn about three tools you can use to help ensure your machine safety labels reduce risk and improve safety – for your company and your machine’s end-users. For help with your safety system or to order your Omron STI safety equipment, call Innovative-IDM at 877.906.2100 or send us an email at info@iidm.com. Hi, I’m Adam Ring with Innovative-IDM. You know, when I walk through manufacturing plants, sometimes I’ll come across a control panel where you open it up and look inside and you see this technology that is like 30, 40 years old. So what’s starting to happen is, customers are finding that a lot of the controls in their automation are starting to really become aged, and when that happens if something breaks it’s really, really hard to find. We find a lot of people who try and search on eBay to find replacement parts. Sometimes they’ll send them in and try to get parts repaired. But as they continue to age, the repair gets more and more expensive and eventually things just get to the point where they’re not repairable anymore. One of the worst things that happens is a major component necessary for the operation of a machine goes out and then the machine is completely rendered useless until you either find a new part or completely rebuild the controls for it. And so by retrofitting a control panel, you’re able to remove any of those obsolete components and replace them with the current up-to-date stuff that’s readily available. It gets rid of all of your hard to find really difficult parts, it enables you to not have to worry about repairs for a while. Typically the life of a new control panel, before you have to really start repairing stuff, usually lasts about 10 years before it starts to break down and then you eliminate that big terrible major risk of down time. And everyone knows, whatever the cost to build a new control panel is usually minimal in regards to or compared to what it costs if a machine goes down or can’t produce products for weeks or months on end while a new control panel is being designed and built. So overall, it’s a really good idea if you’ve got aged control panels where a component going out could really, really cost some major downtime and production loss, it’s a good idea to go ahead and take a look at retrofitting those control panels. If you’d like help in that regard take a look at innovativeidm.com. We are Home of the Legendary Customer Experience.